When we go to work, more often than not we face tiring, exhausting, and sometimes stressful activities. But that’s normal – those are some of the things that comprise your everyday work life. However, the result of those tiring tasks is that you can lose your focus and become distracted. Hence, the progress of your work will slow down and you will feel really unproductive. Here are some tips to help you become more attentive and have greater focus at work. The first way to have better focus at work is to get rid of what distracts you. How? Take away some stuff from your desk that you don’t really need. If it’s not necessary, keep away your phone and bag so you won’t be tempted to check. Though some people find focus on messy desk (if it works for you, then good), it is also good to keep your files and other work-related things organized. If you are distracted by the background office sound, you can listen to music using your headphones. If you work in front of the computer, this is important: organize your PC as well as your desk. Make sure to make one folder containing all related files to one task. Make sure to label all folders correctly so that you will not only save time, you will also not become distracted. In addition, make sure that your PC is free from viruses and update your antivirus software regularly to save the time and hassle of repairs. Another distraction you can control is your grumbling stomach. Don’t starve yourself – it is common knowledge that an empty stomach can induce headaches, change your mood, and cause you to lose focus. Have a snack within arm’s reach. Snacks such as raisins, almonds, and carrots are known to help you become more focused and pumped to finish tasks. If you can have some snack while grinding your day away, of course you will need something to drink, too. But instead of having some juice or caffeine, you can have water instead. Not only is it healthy to chug water, it is truly refreshing as well and the best option when you are trying to lose weight. Once you feel the pangs of hunger, just drink a glass and you will feel good again. Keep water near you at all times so you won’t have to go back and forth to the very distracting water cooler station. We are all just humans and can lose interest at times, especially when we go to work every day. But once you find meaning and inspiration, you will feel better and have more focus at work. So how can you do it? It can either be a minute of prayer or affirmation, or simply ask yourself what are you thankful for and who are you doing it for. Do these before you start your work every day and be inspired. When your work requires you to sit down most of the time, it can get really distracting, especially if your chair or table doesn’t suit you very well. Quit suffering and get a comfortable, ergonomic chair that has a better back support and a well-suited desk that has great leg space. It has been observed that the first hour is when most people are very productive because you still have energy. Prioritize the most stress-inducing tasks in the first hour so you can finish them first. This method will help you not only have more focus but you don’t have to feel stressed at the end of the day. 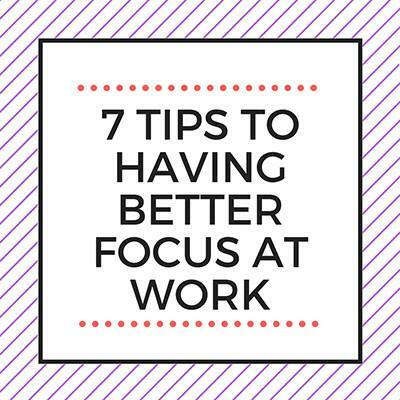 You can follow these tips on how to have better focus at work and in no time you will become more productive and happier at work. And, in the future, you might get the promotion you deserve.